This incredible vacation deal will take you to discover the beautiful white sand beaches of Cancun. Bathe in the blue of the ocean and have fun with water and land activities, taste the delicious Mexican and international cuisine, and learn about the culture of the destination. 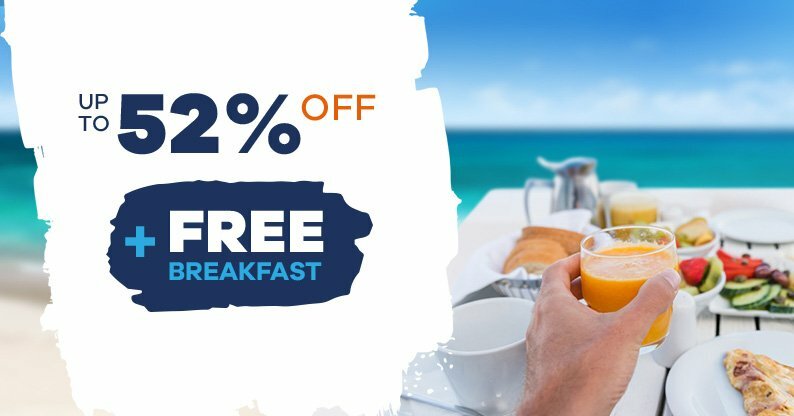 Make the most of your vacations with this promotion and receive a special discount of 50% plus an additional 10% on rack rate when booking the suite of your choice at The Royal Caribbean, a beachfront family resort in Cancun, including daily buffet breakfast all suite guest. Book now and travel anytime and experience the perfect beach family vacations with Royal Reservations! This promotion includes a daily buffet breakfast per person confirmed in your confirmation letter. Additional meals and drinks will have an additional charge. "I loved this place! It's in a perfect location, you can walk to the street and take the city bus to the Isla Mall or other spots in this PARADISE. You can also take the "Royal" shuttle to different Royal Resorts, which gives you the opportunity to try the different restaurants and beaches. Make sure to go on a cenote tour!" "We are a family of 4 and we enjoyed our stay at a beachfront family room. Great views and great room with plenty of facilities for self catering apartment. With a supermarket on site you can prepare your own meals in the room or even order take outs from the restaurants. Pool is great fun with daily happy hour at the pool bar." "We stayed in a 2 bedroom penthouse that was beautiful. Very clean, and the staff was very friendly and helpful. We spent the early mornings out on out balcony watching the sunrise over our gorgeous view of the pools, the clubhouse, the sun deck, the beach, and the Caribbean. The food was delicious.The pools were great."